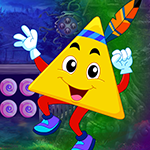 G4K Dancing Triangle Escape is another point & click escape game developed by Games4King. There was a small town and the city was very beautiful. The city was different. There was a dancing triangle in that strange city. The dancing triangle was kept in a house where some people lived. It is your duty to rescue the dancing triangle. It will help you to find the hidden clues in the form of colours and numbers and to find the items where the dancing triangle is to save the creature. Find them all and solve all puzzles to free the dancing triangle. Good luck and have fun! When you get to the 3 size circles, the numbers are both sequence & rimes pressed. Hatchet for spot on tree in leftmost scene. "Lifeline" is tricky.. Second rise is supposed to be shorter than fourth. I'm at 3 circles, Unknown. Tried smallest once, medium one twice, largest one 3 times, didn't work. Opposite order didn't work either. What next? Sugarcrush, follow pattern exactly as on tree. Big twice, mid once, small thrice. Ahh, he didn't say we needed to find a clue first. Just found it, lol! And out. Quick and fun. Thanks, G4K. 2(big) 1(medium) 3(small) doesn't work.